When searching for an RV, identifying the right one can be difficult. First, you must decide between motorhomes and towables. Then you need to identify what type of motorhome or towable is right for you. 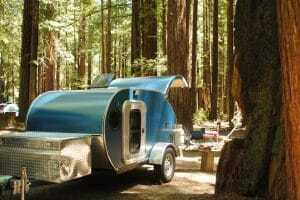 Before you decide, you’d better take not how versatile and plain awesome toy haulers are. 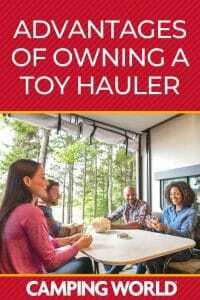 Toy haulers come regularly come in travel trailer and fifth-wheel forms. A toy hauler is an RV with an added space in the rear to store and transport your AVT, motorcycle, dirtbike, golf cart, or any other motorized toys you have that you want to bring along while you travel. While not everyone needs a toy hauler, everyone should consider the RV type as an option. Here are three advantages of the RV type. 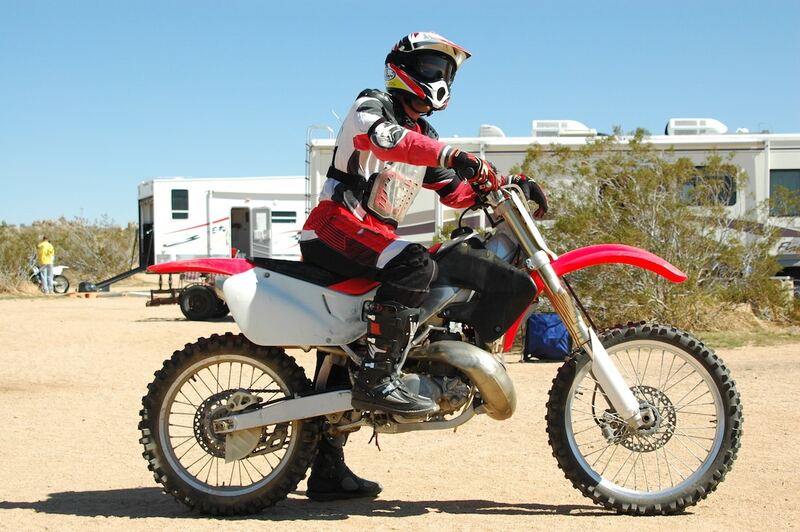 Have a dirtbike, motorcycle, ATV, or golf cart you want to take camping with you? Then a toy hauler is the only way to go. The large garage spaces are perfect for these types of things. In fact, they’re designed specifically for them. They often have tie-down points on the floor and walls. Even if you don’t have a toy you want to bring with you, the garage space is perfect for cargo you don’t use very much, bicycles, skateboards, snowboards, paddle boards and anything else you want to bring along. 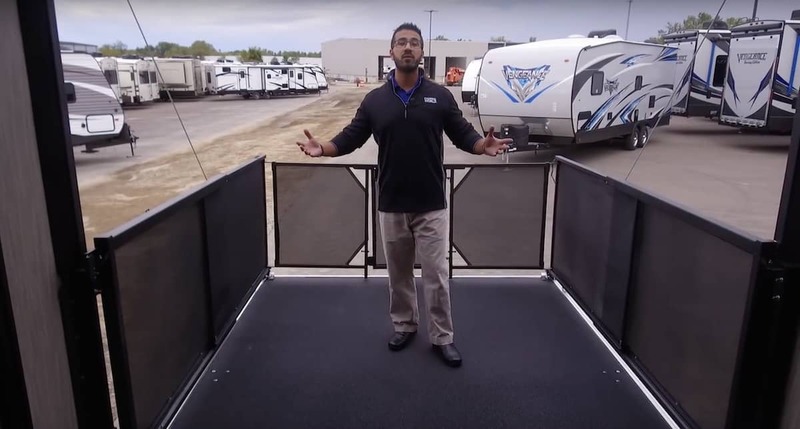 The garage area in a toy hauler is perfect for dirtbikes, motorcycles, golf carts, etc, but it also doubles as a living and sleeping area in most models. Most have foldaway tables and seating as well as queen beds that raise out of the way and can be lowered at night. This provides you with a whole extra room for entertaining or just hanging out. Many toy haulers have a wall or curtain between the garage and the rest of the RV. 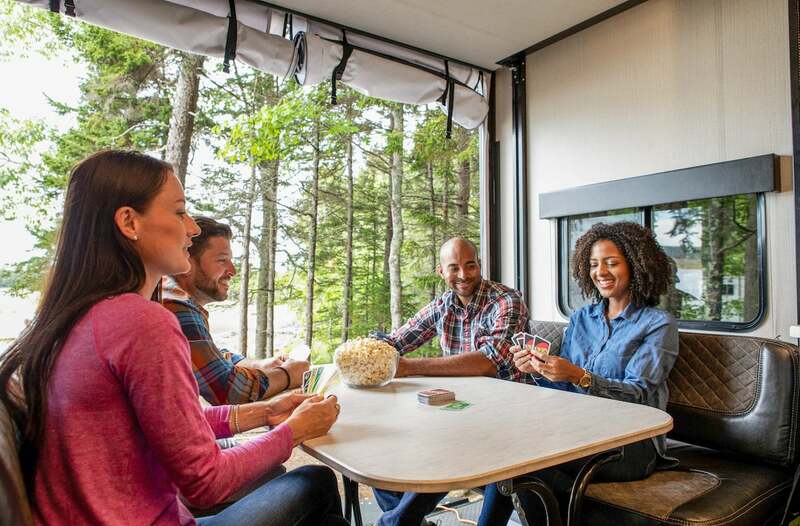 This is nice if you have a family because you can let your kids have the garage space to play while you’re chilling out in the living or bedroom area of the RV. That ramp for the garage area on a toy hauler can do double duty. That’s right. It can extend straight out and give you a nice deck. The party deck, as it’s known, comes with side walls to help keep people from falling off and is a great way to enjoy the outdoors. You can set up folding chairs or some other kind of furniture, plop down next to a friend, and relax the day away. The garage may be the best part of about owning a toy hauler, but a party deck is a close second, at least for me. Not all toy haulers have the ability to do this though, so if it’s a feature you want, make sure the model you’re interested in has it. Any other advantages that I missed? Tell me! Leave a comment below. I would like to see the trailer companies build trailers that easily handle the new wider UTV’s that are on the market now. I have a New toyhauler and I can just bearly fit my Polaris General in it because of the wide wheel width. Hey Howard, definitely something manufacturers will have to learn to accommodate in the future. Thanks for pointing that out. I put my 2013 Polaris Ranger 900XP in my toy hauler. There is plenty of room at the wheels. I can walk on all four sides of the Ranger when it’s parked in the garage. However, the clearance at the roll bar is a different matter. I have about 2″ to 3″ of clearance between the roll bar and the cabinets. I’ve already busted one of the cabinet handles off. I now use chains with a chain binder to put just enough tension on the suspension to keep the body from rolling. My trailer is a 2006 Fleetwood Gearbox 220FB. I looked long and hard for a trailer that fit my budget and fit my ATV. There are a lot of toy haulers out there with insufficient height at the cargo door to fit my Ranger in. Interesting. I thought the General was narrower than the Ranger but it looks like it is 2″ wider. can’t build it over 8’6″ wide.. that would require a special oversize permit issued from every state you go into. ; with that comes extra insurance and bonds. The disadvantage of most toy haulers is that they can be quite heavy. Many of them are outside the towing range of a 1/2 ton truck. My toy hauler has a GVWR of 11k lbs and I use a 1 ton truck (F-350) to pull it. I tried pulling it with a 1/2 ton truck, even when completely empty around town, and it was a very uncomfortable towing experience. The tongue weight of toy haulers can change significantly when the garage is occupied or empty. My tongue weight goes up by 500 lbs when the garage doesn’t have my side-by-side parked in it. A disadvantage of a toy hauler without a dedicated garage is that to sit down and eat or to sleep the garage has to be empty. Will my next trailer be a toy hauler? I’m leaning towards a plain fifth wheel instead and I’ll pull the ATV on a trailer behind the fifth wheel. Excellent points, Jim. You’re totally right. Definitely, have to pay attention to tongue weight both when the trailer is loaded up and empty. They are generally heavy trailers and a typical full-size pickup like an F-150 or Silverado 1500 probably won’t cut it. In some cases it may, depending on size, but yeah. That F-350 has to get the job done pretty well, though, right? We purchased a Keystone Impact toyhauler because of the ability to haul a motorcycle or golf cart but mostly because of the second living area. We love parking oceanfront and sitting on the patio while listing to the waves. We added the upper bed which then makes it a double queen area and we added the second a/c for the hauling area. We love how wide and high the ceiling is. I don’t believe I will ever be any other type of RV because I enjoy the space.